It’s been a few weeks since the NFL draft and OTA’s are in full swing. Some rookies have made a big impression so far while others have yet to even see the field. However, with about three months until the season starts it’s time to start looking at where to take your rookies. We’ll look at where these players were taken in our initial, IDP draft for some comparisons. 1st Overall Pick – Sammy Watkins, WR – Buffalo Bills (Previous position: 1st overall) – Not much has changed on the Watkins front. Barring some positional needs in your draft, Watkins should be going first overall. His combination of ability and size are unmatched and his value shouldn’t be hindered by the quarterback position. Either Manual will progress now or Watkins can look for another quarterback later. 2nd Overall Pick – Mike Evans, WR – Tampa Bay Buccaneers (Previous position: 2nd overall) – Evans ran in to a tough situation in Tampa where he’s surrounded by above average players at every skill position: Vincent Jackson, Doug Martin, even fellow rookie Austin Seferian-Jenkins. There’s also concern that Tampa will be a run-heavy team, taking away chances from Evans. But his talent is too tough to ignore at this point. 3rd Overall Pick – Bishop Sankey, RB – Tennessee Titans (Previous position: 14th overall) – The first running back off the board, Sankey has come a long way since our first mock draft. Sankey is widely expected to be the only rookie starting in Week One due to no competition in Tennessee. Shonn Greene is recovering from knee surgery and Dexter McCluster is exclusively a receiving back. Jake Locker is his quarterback, for now, but that should change next year which can only improve his situation. 4th Overall Pick – Brandin Cooks, WR – New Orleans Saints (Previous position: 7th overall) – The Saints traded up for Cooks and plan to use him primarily in the slot. With Lance Moore and Darren Sproles gone, there’s a lot of targets to go around. Cooks is also only 20 which bodes well for his dynasty value. He’s a short, dynamo that will burn the turf in New Orleans. 5th Overall Pick – Eric Ebron, TE – Detroit Lions (Previous position: 3rd overall) – The first tight end off the board, Ebron has loads of talent but enters a crowded lineup. Not only will he compete for targets with Calvin Johnson but the Lions signed Golden Tate, re-signed tight end Brandon Pettigrew and have emerging tight end Joseph Fauria. In short, Ebron might struggle the first year but the situation should shake itself out by 2015. If Ebron can address the slight concern some have about his hands, he could be a top-tier tight end. 6th Overall Pick – Jordan Matthews, WR – Philadelphia Eagles (Previous position: 6th overall) – Picked exactly where he was last time and with good reason. Matthews enters a high-octane offense where he’s expected to immediately man the slot. Beyond this year, there’s no guarantee Jeremy Maclin will be back and Riley Cooper is an average talent. With Nick Foles and Chip Kelly around, Matthews should shine. 7th Overall Pick – Odell Beckham, Jr., WR – New York Giants (Previous position: 9th overall) – The third receiver taken in the NFL draft, ODB is the fifth receiver taken in this mock draft. Pro-ready, he steps in to the starting lineup in New York where the Giants offense is expected to go pass heavy. There is little competition for targets opposite Victor Cruz and Beckham should contribute right away. 8th Overall Pick – Marqise Lee, WR – Jacksonville Jaguars (Previous position: 11th overall) – Lee moves up a few spots from the last draft and should top out about here. He has good measurables but also gets points for getting the start early. He’s manning Justin Blackmon’s old spot on the outside where it was a productive spot despite shaky quarterback play. Lee isn’t as talented as Blackmon but should stay on the field. 9th Overall Pick – Jace Amaro, TE – New York Jets (Previous position: 10th overall) – Amaro will have the best chance of any rookie tight end to contribute early. With an improved offense in New York, Amaro could greatly benefit and provide some impact himself. Strictly a ‘move’ tight end, he will have to work on his blocking to become a truly top-end tight end in dynasty leagues. But he is quite the receiver and should have the stats to show for it. 10th Overall Pick – Kelvin Benjamin, WR – Carolina Panthers – (Previous position: 15th overall) – Perhaps the most polarizing pick in rookie drafts, Benjamin has the makings of a WR1 but could just as easily be a bust. He does have a great quarterback to be on the receiving end of and will have plenty of targets his way. However, with little support surrounding him, it could be difficult for him to learn. 11th Overall Pick – Carlos Hyde, RB – San Francisco 49ers (Previous position: 8th overall) – Hyde was widely considered the top running back in the NFL draft and was scooped up by one of the top running teams in the league. The only thing holding Hyde’s dynasty value back is the crowded backfield in San Francisco. However, Frank Gore is a free agent after 2014, as is Kendall Hunter. Marcus Lattimore is not all the way back leaving the door wide open for Hyde. 12th Overall Pick – Jeremy Hill, RB – Cincinnati Bengals (Previous position: N/A) – Our first big jump is the current second stringer in Cincinnati. Hill is a pro-ready blocker which will probably lead to BenJarvus Green-Ellis’ being cut. He’ll be the inside / goal-line option to Giovani Bernard but won’t cut into Bernard’s value. If anything, he’s a high-floor, low-ceiling option at running back. 13th Overall Pick – Devonta Freeman, RB – Atlanta Falcons (Previous position: 24th overall) – Another big jump was Freeman by a whole round. Freeman has shown enough pass block/catch ability early on to warrant third down work in Atlanta. And with as much as Atlanta is expected to pass, that could be worth something. For dynasty purposes, the current starter, Steven Jackson, is on the wrong side of 30 and could be cut next year to save nearly $4 million in cap space. There’s little competition to challenge Freeman which should mean plenty of work. 14th Overall Pick – Johnny Manziel, QB – Cleveland Browns (Previous position: 17th overall) – The first quarterback taken in the mock draft, Manziel has a good shot to start early but could find himself short of a supporting cast. He’s got the arm and is mobile but his height brings in to question if he can take the beating. However, in an average quarterback class, Manziel could end up being the best of the bunch. 15th Overall Pick – Teddy Bridgewater, QB – Minnesota Vikings (Previous position: 12th overall) – Bridgewater drops a little bit but should still end up starting week one. He has a ton of talent surrounding him and Norv Turner as his offensive coordinator. However, the concerns that made Bridgewater drop in the NFL draft need to be avoided in training camp before you take him in your rookie draft. 16th Overall Pick – Davante Adams, WR – Green Bay Packers (Previous position: 20th overall) – Adams moves up a bit thanks to more optimism that he’ll be able to contribute to the pass-heavy Packer offense. He led all of college football in receptions and touchdowns thanks to great hands and leaping ability. That should translate to the NFL. He’s currently fourth on the depth chart but Jordy Nelson is a free agent after 2014. 17th Overall Pick – Austin Seferian-Jenkins, TE – Tampa Bay Buccaneers (Previous position: 4th overall) – ASJ joins a suddenly deep roster of skill position players. He’ll easily pass 2013 surprise Tim Wright but will still be behind Vincent Jackson, Mike Evans, and maybe even Doug Martin. However, his talent should win out in the end. 18th Overall Pick – Cody Latimer, WR – Denver Broncos (Previous position: 22nd overall) – Latimer is big and has great hands and enters one of the best passing offenses in the league. However, he’ll start no higher than fourth on the depth chart for 2014. For 2015, Wes Welker will most likely be gone while Emmanuel Sanders could easily be cut. If Latimer could be the new Eric Decker in Denver, Latimer could flirt with WR1 status. 19th Overall Pick – Blake Bortles, QB – Jacksonville Jaguars (Previous position: 16th overall) – Bortles drops a bit thanks to Jacksonville’s insistence on sitting Bortles for most, if not all, of 2014. Bortles offers the most upside of the quarterbacks in this year’s class but has a lot of learning to do. He’s also surrounded by talented receivers which will make it easy to catch up. If you have a deep roster or taxi squad, Bortles could be an option. 20th Overall Pick – Ka’Deem Carey, RB – Chicago Bears (Previous position: N/A) – Carey will start the season as Matt Forte’s primary backup and should be able to take some of the load off. He didn’t have a great combine but did show a lot of ability in college. With Forte getting a year older, a long-term solution is needed in Chicago. 21st Overall Pick – Charles Sims, RB – Tampa Bay Buccaneers (Previous position: N/A) – Sims has good pass catching ability and could get some work in early in Tampa. With Doug Martin in Tampa, Sims will probably never be a featured back but will have value in PPR leagues. However, Tampa may not be as pass-heavy as others so his ceiling is limited. 22nd Overall Pick – Tre Mason, RB – St. Louis Rams (Previous position: 23rd overall) – Mason doesn’t have the size or ability to be a featured back but could provide some change-of-pace for incumbent Zac Stacy. He does appear to have more talent than other Rams running backs Isaiah Pead and Benny Cunningham but could still struggle to find carries as a rookie. His ceiling and floor are pretty limited. 23rd Overall Pick – Terrance West, RB – Cleveland Browns (Previous position: N/A) – West has drawn comparisons to Alfred Morris thanks to his small school background and cutback ability. He also doesn’t face much competition even with the signing of Ben Tate after the Browns traded up for him. Tate is only on a two-year deal and the Browns have a young, good offensive line. He’s an ideal late second round pick that could even make an impact this year. 24th Overall Pick – Donte Moncrief, WR – Indianapolis Colts (Previous position: N/A) – Moncrief has the tools and ability to be a top-end receiver and after an impressive combine, landed in Indianapolis. Moncrief will be a good pick at the end of the second round of rookie dynasty drafts with Reggie Wayne close to retirement and Hakeem Nicks playing on a ‘prove it’ deal. Less than a week removed from the 2014 NFL draft, it’s already time for mock rookie dynasty drafts. Personally, it seems like there are more potential dynasty prospects this year then there have been which is a great problem to have for your dynasty team. Let’s look at where the rookies ended up in our first edition of a dynasty rookie mock draft for 2014. 1st Overall Pick – Sammy Watkins, WR – Buffalo Bills – The most generous comparisons call Watkins a smaller Calvin Johnson and his measurables and talent are unmatched in this receiver class. He steps in to Buffalo atop the depth chart from week one. This pick isn’t a slam dunk but it’s close. Watkins is surrounded by talent but his ultimate value will be determined by his quarterback. Current Bills quarterback E.J. Manual will either progress to a legit NFL starter or he’ll bomb and Buffalo will be in the market for a new quarterback soon. Both scenarios will be to Watkins advantage. 2nd Overall Pick – Mike Evans, WR – Tampa Bay Buccaneers – If Evans ended up in a different situation, I could conceivably but him ahead of Watkins. However, he’ll start his career as the clear #2 in the passing game but faces competition for touches from each offensive position. The quarterback situation is slightly better than in Buffalo as Josh McCown has proved adequate and (potential) future starter Mike Glennon has some potential. Evans will step in to Vincent Jackson’s role once Jackson moves on and should top out as a WR1 in dynasty. 3rd Overall Pick – Eric Ebron, TE – Detroit Lions – The first tight end off the board was also the first tight end selected in the NFL draft. On the surface, this is a match made in heaven with the highly talented Ebron going to one of the most pass-happy offenses in all of football. New offensive coordinator Joe Lombardi came from New Orleans where he mastered the use of a tight end. There will be a few draw backs as the fight for targets will be fierce among Calvin, the newly signed Golden Tate, and emerging tight end Joseph Fauria along with running back Reggie Bush. But for dynasty purposes, Ebron has the best situation and could be a stud real soon. 4th Overall Pick – Austin Seferian-Jenkins, TE – Tampa Bay Buccaneers – The first surprise of the mock, ASJ has the most potential of the tight end bunch. Standing at 6′ 6″, he’ll immediately unseat incumbent Tim Wright but join the battle for touches early on. However, for dynasty purposes, after Vincent Jackson moves on and ASJ establishes his red zone presence, he should be a TE1 in dynasty. For PPR leagues, pass-catching tight ends are a premium, which is why ASJ is the pick here. 5th Overall Pick – Jadeveon Clowney , DL – Houston Texans – Assuming Clowney stays at defensive end, he’ll make an immediate impact on your dynasty team. Projecting as a Julius Peppers-type, dynasty teams should kill for the chance to add someone who will get double-digit sacks every year for the foreseeable future. However, monitor this situation closely as his value is inherently tied to his position and there have already been whispers about him being considered a linebacker. Be sure to confirm the designation your league has given him before drafting. If they keep him at end, draft him here. If not, you can wait. 6th Overall Pick – Jordan Matthews, WR – Philadelphia Eagles – Any receiver in the Eagles offense should be considered but Matthews age plus size plus hands makes him the top receiver off the dynasty board after Watkins and Evans. The departure of DeSean Jackson along with the recovery of Jeremy Maclin means Matthews could step right in and produce. If quarterback Nick Foles can keep up his 2013 pace, Matthews should have no problem matching Jackson’s production year-in and year-out. 7th Overall Pick – Brandin Cooks, WR – New Orleans Saints – Cooks steps in to, arguably, the best situation possible for a receiver. Trading up to get him, the Saints will put Cooks in the slot and let him move all over the field. It’ll be a departure for the Saints who haven’t had a quick, shifty talent like Cooks before. However, like any high-powered offense, he’ll be fighting for targets. But when/if Marques Colston breaks down, Cooks could be the top receiver on the depth chart and should provide production immediately. 8th Overall Pick – Carlos Hyde, RB – San Francisco 49ers – Hyde was, surprisingly, the third running back off the board in the NFL draft but is the first one taken in this dynasty mock draft. Hyde was considered the top running back prospect by many but enters a crowded running back situation. He won’t produce a lot this year but his dynasty value is pretty high. The 49ers appear to be ready to move on from Frank Gore after his contract runs out this year and there is some talk about Marcus Lattimore not being ready for the season. If things break a certain way, Hyde will be the top back in San Francisco as early as 2015. 9th Overall Pick – Odell Beckham, Jr., WR – New York Giants – After hinting they weren’t happy with their current receiver situation, the Giants grabbed Beckham where he should immediately step in as the 2nd option in the Giants passing game. It was quite possible ODB would go in the top 10 of the actual draft so the talent is there. His value will be determined by the recovery of Eli Manning and if he can return to form. If so, Beckham would be a bargain at this spot for dynasty owners. 10th Overall Pick – Jace Amaro, TE – New York Jets – Of the three tight ends in this mock draft, Amaro could contribute the most right away. He enters a situation without many weapons but does have a decent quarterback situation, at least if Mike Vick ends up on top. Ironically, he’s also the most raw of the three and has little-to-no value in the run game. But if he can create separation in the NFL, something he didn’t have to do a lot in college, he could be a stud. 11th Overall Pick – Marqise Lee, WR – Jacksonville Jaguars – Slipping to the second round of the NFL draft, Lee steps in to a promising situation in Jacksonville. The Jaguars drafted a quarterback in Blake Bortles for the long-term and have some talent in the ranks with Cecil Shorts. Excellent route runner who was beat up in 2013, his 2012 looked like a carbon copy of Hakeem Nicks when healthy. Great hands, great route running, willing in the run game so he won’t come off the field. 12th Overall Pick – Teddy Bridgewater, QB – Minnesota Vikings – The first quarterback taken in this mock draft, Bridgewater definitely has the clearest path to starting immediately. He also has a few dangerous weapons at his disposal in Adrian Peterson, Cordarrelle Patterson, and even Kyle Rudolph. If he can replicate what scouts saw on his game tape in college, he’ll be a low-end QB1 in no time. 13th Overall Pick – Ryan Shazier, LB – Pittsburgh Steelers – Shazier shot up draft boards and ended up as mid-first round pick in the NFL draft. He’ll immediately step in as an inside linebacker in Pittsburgh’s very aggressive 3-4 system. He’s surrounded by talented outside linebackers in Jarvis Jones and Jason Worilds and should rack up tackles immediately. His best attribute is his speed and is able to cover sideline-to-sideline. He should top out as a LB1 in dynasty leagues. 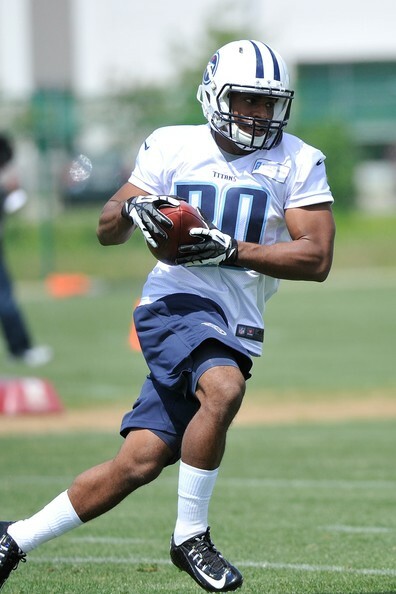 14th Overall Pick – Bishop Sankey, RB – Tennessee Titans – The first running back taken in the NFL Draft, Sankey has a ton of talent but will need to be coached well. He also is going to a poor team without a lot of talent and coaching that isn’t conducive to running backs. However, he should see significant carries immediately and could even take over the starter’s role from Shonn Greene before the season starts. Long-term, his outlook isn’t as strong as Hyde’s but an infusion of talent could change that. 15th Overall Pick – Kelvin Benjamin, WR – Carolina Panthers – Welcome to your ultimate boom-or-bust pick in Benjamin. He’s still raw and would, ideally, have landed on a team with veterans for him to learn from and take his time. However, he’s being thrown to the fire thanks to the lack of depth in Carolina. Dynasty leaguers should know pretty quickly if they have a stud on their hands as he currently projects as a starter. Benjamin is a huge player and should be a top red zone target. He could top out as a WR1 or a taxi squad player. 16th Overall Pick – Blake Bortles, QB – Jacksonville Jaguars – The most raw quarterback of the bunch, Bortles also has the highest ceiling. He’ll have a long leash as the third overall pick and would be an ideal taxi squad player for your team his rookie year. The Jaguars have openly said they’d like to go run-heavy so there won’t be a lot of pressure early. They’ve also added some talent around the position to soften the learning curve. If you can afford to wait on a quarterback, Bortles should be your pick. 17th Overall Pick – Johnny Manziel, QB – Cleveland Browns – Manziel’s dynasty value took a big hit with the news of a possible Josh Gordon suspension. Coaches have also started very clearly that Manziel is the backup behind Brian Hoyer. However, for dynasty purposes, Cleveland is a team on the rise with an outstanding offensive line. The question remains if he can take the hits but if he does, watch out. 18th Overall Pick – C.J. Mosley, LB – Baltimore Ravens – Mosley was upset as the top linebacker taken in the NFL draft by Shazier but lands on a great team where he could thrive. He has speed and cover skills but will need to overcome the injuries that seem to plague graduates from Alabama. He also will have competition with Arthur Brown but, for dynasty purposes, should have great value long-term. 19th Overall Pick – Khalil Mack, LB – Oakland Raiders – The Raiders deserve kudos for taking a great prospect and improving their defense. Mack is a great pass-rusher from day one and will rack up sacks in the Aldon Smith mold. He won’t have a lot of tackles but for big-play leagues, Mack could be a LB2/3 for many seasons. 20th Overall Pick – Davante Adams, WR – Green Bay Packers – Adams turned out a bunch of production at Fresno State and enters a positive fantasy situation in Green Bay. He’s a possession receiver on a team with a lot of targets. He’ll start the season behind Randall Cobb, Jarrett Boykin, and Jordy Nelson but is an ideal taxi squad player. 21st Overall Pick – Paul Richardson, WR – Seattle Seahawks – Richardson has talent but has serious injury concerns. He also isn’t a prototypical #1 receiver, size-wise, and goes to an extremely run-heavy team. He’ll enter the season fifth on the depth chart and should only be considered if you have taxi-squad availability. 22nd Overall Pick – Cody Latimer, WR, Denver Broncos – Latimer is a fantastic, late round dynasty option. Tall, young and great hands is a great combo and he’s heading to pass-happy Denver. He probably won’t contribute a lot this year but Wes Welker is a free agent next year and Latimer will be next in line. 23rd Overall Pick – Tre Mason, RB – St. Louis Rams – Drawing comparisons to Ray Rice, Mason needs coaching in the passing game to be anything other but a change of pace back. The depth behind Zac Stacy isn’t strong so he could open the season as the clear backup but won’t do anything to unseat Stacy as a starter. 24th Overall Pick – Devonta Freeman – RB – Atlanta Falcons – Freeman is pass-protection ready and has good hands and should unseat Jacquizz Rodgers immediately for targets. With only Stevan Jackson posing any real threat on the depth chart, Freeman could be a starter as soon as next year in a high-powered offense. Another good player to have on your taxi-squad. Introducing the inaugural DFFC 2014 NFL mock draft. In short, this is a dynasty leaguers dream year with more than 20 potential dynasty picks in the first round alone. Below is what DFFC sees happening in the NFL draft in May. 1.1 – Houston Texans – Teddy Bridgewater – QB – Louisville – Bridgwater appears to be the most NFL-ready quarterback in the draft and Houston is desperate to right the ship at that position. Bridgewater is the safe choice for a team that could make a quick turnaround. 1.2 – St. Louis Rams (via Washington) – Johnny Manziel – QB – Texas A&M –With two picks in the first they have the luxury of affording a risk with their first pick. 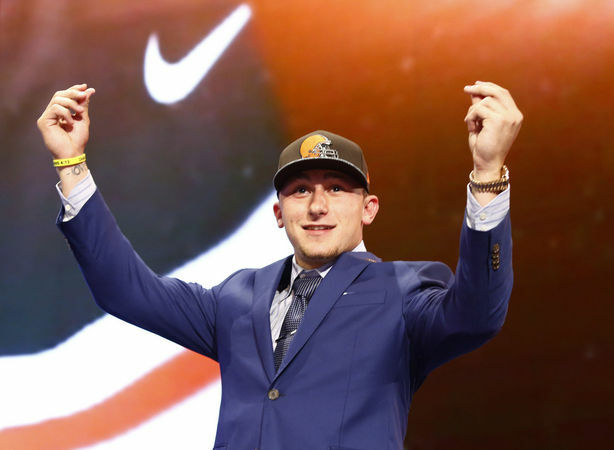 Bradford costs 14 million against the cap and Manziel may be better from day one. 1.3 – Jacksonville Jaguars – Jadeveon Clowney – DE – South Carolina – For a team that was dead last in sacks, defensive line help is a priority. Couple that with the fact that Jacksonville is desperate for talent in general and Clowney is an easy choice. 1.4 – Cleveland Browns – Blake Bortles – QB – UCF – They are praying for Manziel to make it here but fate isn’t on their side. Bortles is the most talented QB left and makes some sense here depending on who the coach is. Big, strong-arm and tough are all things the front office values in a QB so Bortles is the pick. 1.5 – Oakland Raiders – Jake Matthews – OT – Texas A&M – Oakland has a lot of holes it could fill but quarterback is the most glaring. With the top-tier options already gone, it’s better to get value with this high of a pick. Oakland’s left tackles ranked 57th (Jared Veldheer) and 59th (Khalif Barnes) so the best player available also fills a big need. 1.6 – Atlanta Falcons – Greg Robinson – OT – Auburn –The Falcons are pleased to have a choice between Robinson and Barr and decide to go with the OT. Robinson is an absolute mauler in the run game with the athleticism to be a premiere pass blocker as well. He should provide an immediate boost to the run game from day one. 1.7 – Tampa Bay Buccaneers – Anthony Barr – LB – UCLA – Tampa would be thrilled to pair, possibly, the top pass rusher in the draft with star-in-the-making Lavonte David and cut them loose. And with a division full of superstar quarterbacks, Tampa needs all the help they can get to contain them. 1.8 – Minnesota Vikings – Timmy Jernigan – DT – Florida State – Once coaches look through tape of this run stopping monster they are going to fall in love. With him and Floyd in the middle new coach Mike Zimmer has his version of the Williams wall to build around. 1.9 – Buffalo Bills – Eric Ebron – TE – North Carolina – Adding Ebron to the stable of young talent surrounding quarterback E.J. Manual will go a long way towards Manual’s development. Ebron, at 6′ 4″ and 245 pounds, is the best tight end prospect to come out of the draft since Vernon Davis and will be an excellent safety net for Manual. 1.10 – Detroit Lions – Sammy Watkins – WR – Clemson – The Lions have been looking for an explosive WR opposite Megatron for years and now they have one. They gave bigger needs at CB and LB but Watkins is just too good to pass up at this point. 1.11 – Tennessee Titans – Stephon Tuitt – DL – Notre Dame – Tennessee actually had a decent defensive output last year, collectively ranking 8th according to Pro Football Focus. But with the top-tier quarterbacks gone, and 11 a tad high for the first running back off the board, the Titans go for value with Tuitt. Tuitt is big enough to play inside but quick enough to play outside. He’ll add even more youth and flexibility to a good, young defensive front in Tennessee. 1.12 – New York Giants – C.J. Mosley – LB – Alabama – The Giants had by far the worst set of linebackers in the league and Mosley fixes that instantly. MLB with range and intelligence should be a ten-year starter for a defense that struggled last year. He’ll be one of the first rookie IDP-ers taken in your dynasty drafts. 1.13 – St. Louis Rams – Mike Evans – WR – Texas A&M – The selection of Evans completes the two-year make over of the Rams offense. His size and ability to go up and catch the ball is unparalleled in this draft. Pairing him with his college quarterback, Manziel, should excite St. Louis fans. It could be the Greatest Show on Turf 2.0. 1.14 – Chicago Bears – Khalil Mack – LB – Buffalo – The Bears get the best value of the first round in Mack at this spot. With Julius Peppers likely getting cut Mack can fill in at DE and immediately provide the pass rush the Bears need. He is a violent pass rusher and better against the run than you would expect for a guy his size. 1.15 – Pittsburgh Steelers – Taylor Lewan – OT – Michigan – The Steelers have done well to improve their offensive line in recent years. The drafting of David DeCastro went a long way to solidify the interior. The tackle position for Pittsburgh is another story. The top three tackles for Pittsburgh ranked 41st, 44th and 62nd among all tackles according to Pro Football Focus. Not good. Lewan can play at either the left or right tackle position and be an immediate upgrade. 1.16 – Baltimore Ravens – Kelvin Benjamin – WR – Florida State – Get ready to hear the term “catch radius” quite a bit. Flacco seems more comfortable throwing to larger targets and Benjamin is exactly that. The forty time will scare people but it shouldn’t. He knows how to high point and attack a ball and will be an excellent compliment to Torrey Smith allowing him to stretch the field. 1.17 – Dallas Cowboys – Justin Gilbert – CB – Oklahoma State – Taking any defensive player in the first round will be an upgrade for Dallas. Using any statistical measure possible, they were one of the worst defenses in the league in 2013. The highest cornerback ranked on Pro Football Focus’ ratings checks-in at 43 (Orlando Scandrick).The secondary has long been a sore spot and Gilbert should step in immediately as the top-ranked corner off the board. The best part? No trading up to get him a la Morris Claiborne. 1.18 – New York Jets – Marqise Lee – WR – USC – The Jets need weapons in the worst way. Jace Amaro would make some sense here but a playmaker on the outside offers more upside and explosive plays which this offense completely lacked. They are tied to Geno, for better or worse, so here comes the cavalry. 1.19 – Miami Dolphins – Carlos Hyde – RB – Ohio State – Hyde is a big boy and has the quickness to come with it. Checking in at 6′ and 235 pounds, Hyde isn’t easy to take down and also has the hands to be a featured back. Miami needs some consistency in the running game after throwing out Lamar Miller and Daniel Thomas to no effect. With Hyde, Miami can hit the reset button and give quarterback Ryan Tannehill a fighting chance. 1.20 – Arizona Cardinals – Zack Martin – OT – Notre Dame – Offensive line will be the main priority for the Cardinals. If they get Martin at this spot they will have solidified at least one side of the line with last years first rounder Jonathan Cooper coming back fully healthy as well. 1.21 – Green Bay Packers – Ha Ha Clinton-Dix – S – Alabama – Ranking near the bottom of passing yards allowed last year, Green Bay needs to solidify the secondary. Morgan Burnett is ensconced in one safety position after signing a five-year deal before the 2013 season. M.D. Jennings is a free agent and probably won’t be back after he was ranked as the 67th best safety last year, according to Pro Football Focus. Clinton-Dix checks in at 6′ 1″ and 209 pounds, giving him the size to be a bruiser but still the ball location skills needed to be an effective safety. 1.22 – Philadelphia Eagles – Calvin Pryor – S – Louisville – When watching Pryor play he explodes off the screen. A rangy and well-built safety is exactly what this Eagles back four needs. It also doesn’t hurt that he’s by far the most physical defensive back in this draft. 1.23 – Kansas City Chiefs – Jace Amaro – TE – Texas Tech – The Chiefs are already well-constructed and don’t have many glaring holes. However, tight end was a continual weak spot in 2013. They drafted Travis Kelce in the third round last year but lost him for the year due to injury. With a tight end available of Amaro’s ability, it would be too hard to pass up. It’s a well-known fact that Alex Smith is not a ‘gunslinger’ instead opting for short-to-medium routes. Having someone of Amaro’s playmaking ability to throw to will make life a lot easier. 1.24 – Cincinnati Bengals – Darqueze Dennard – CB – Michigan State – The Bengals have a number one corner coming off his second major leg injury. And then Pacman Jones and Terrance Newman. Not only does Dennard fill a hole but he is excellent against the run which Marvin Lewis will love. 1.25 – San Diego Chargers – Ryan Shazier – LB – Ohio State – The Chargers need a better pass rush and Shazier can get that to them in this spot. Ideally a weak-side linebacker, Shazier’s speed is his best attribute which he parlays into getting to the quarterback. With a lineup including Donald Butler and second-year linebacker Manti Te’o, San Diego can roll with a good, young linebacking corps. 1.26 – Cleveland Browns (via Indianapolis) – Cyrus Kouandijo – OT – Alabama – This may seem like a steep fall for the Alabama tackle but the national title game exposed what some people have feared for a while. He’s not great at handling speed off the edge and may have to move to the right side if it doesn’t improve. 1.27 – New Orleans Saints – Louis Nix III – DT – Notre Dame – The Saints defense vastly improved under new defensive coordinator Rob Ryan. One area that still needs to be addressed is the interior as the highest ranking defensive tackle for New Orleans checked in at just 41st (Brodrick Bunkly). Nix III is a great value here and is projected as an ideal nose tackle in a 3-4 defense. 1.28 – Carolina Panthers – Lamarcus Joyner – S – Florida State – Although undersized Joyner is an explosive tackler, great in zone coverage and excellent in run support. The Panthers need help in the secondary and this is the best CB available. 1.29 – New England Patriots – Jason Verrett – CB – TCU – With Pro-Bowler Aqib Talib set to become a free agent, depth is key in the Patriots secondary. While undersized at 5′ 10″, Verrett has 4.4 speed and good coverae skills which culminated in 16 passes defended this year along with six interceptions. 1.30 – San Francisco 49ers – Jarvis Landry – WR – LSU – A proven wide receiver from the SEC seems to fit the profile the 49ers love – great hands going over the middle; tough as nails; an excellent blocker in the run game. 1.31 – Denver Broncos – Scott Crichton – DE – Oregon State – Shaun Phillips has played well this year in Denver’s 4-3 scheme but he’s 32 and a free agent. Crichton checks in at 6′ 3″ and 265 pounds, with excellent speed off the edge. 1.32 – Seattle Seahawks – Davante Adams – WR – Fresno State – Adams was the prime beneficiary of Derek Carr’s coming out party at Fresno State. He finished the year with an amazing 131/1,718/24 line. He has the size (6′ 2″, 216) and speed (4.57) of a solid wide receiver in the NFL. His porous competition in college will be his biggest draw back.